Philadelphia Building Collapse: Rescue Efforts Continue : The Two-Way A building that was being demolished collapsed on to an adjacent thrift store Wednesday. At least six people were killed and 14 people were injured. 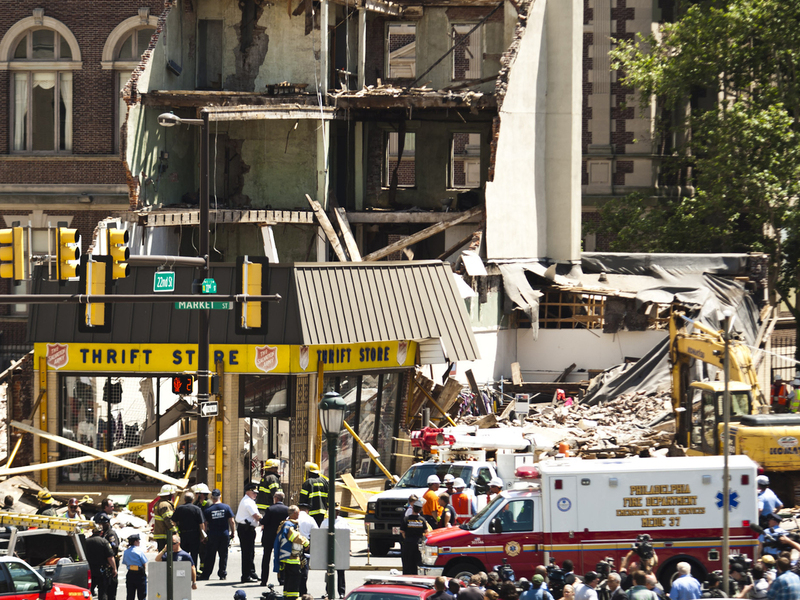 Rescue workers converged Wednesday on the site of a building collapse in Philadelphia. At least six people were reportedly killed and an additional 14 injured. Although reports earlier this morning signaled that efforts at the scene of a building collapse in Philadelphia had turned from rescue to recovery and cleanup, city officials just told reporters that they're still looking for possible survivors. Mayor Michael Nutter and Fire Commissioner Lloyd Ayers did not say there's evidence of anyone else being buried in the rubble of the building or an adjacent thrift store that was heavily damaged. But they emphasized that about 25 percent of the site has yet to be searched. And Ayers said the discovery late last night of a woman — still alive — "is what heavy rescue is all about" and shored up the emergency workers' "spirit and faith." At least six people died and an additional 14 were injured. "Rescue efforts appear to have paused this morning as the death toll stands at six in Wednesday's building collapse in Center City Philadelphia," WHYY writes. The station adds that according to the latest information from authorities, "14 people were injured in the collapse. One woman remains in critical condition in the ICU at the Hospital of the University of Pennsylvania." Philly.com says "a search and rescue operation that was expected to continue today has apparently been suspended." The news site adds that "police officers at the scene said rescue efforts paused before dawn. One officer said workers are now concentrating on clearing the rubble. No obvious signs of rescue efforts were underway beginning about 6 a.m. this morning when reporter Kevin McCorry arrived." According to WHYY, "some experts say shoddy demolition practices ... may be to blame for yesterday's building collapse." "The collapse occurred as shoppers fatefully filled the Salvation Army thrift store on a busy Wednesday morning, unaware that an excavation crew ripping down walls at a gutted building next door was about to yank a beam with heavy machinery." Philadelphia Mayor Michael Nutter and other officials are expected to brief reporters around 10 a.m. ET. We'll watch for news and update as warranted. For more background, see our coverage from Wednesday. Also, we're adding WHYY's Storify coverage, which it continues to update. As happens with stories such as this, what's being reported will likely change as the situation develops. We'll continue to focus on reports from outlets with reporters at the scene and statements from officials. If things change, we'll update.